One easy way to save yourself money is to switch to using rechargeable batteries for all your devices. This eight-pack from top-rated brand SunLabz should be enough to get you started and, bundled with a charger, it’s currently 40% off. 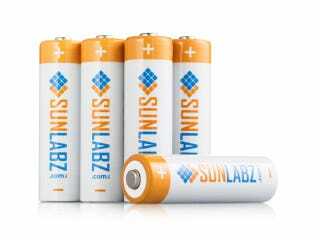 The SunLabz batteries each have a lifespan of 1000 charge cycles, and they have over twice the capacity of regular disposable batteries. By using power from your wall socket, not only are you saving money, but you are saving the environment, too — every battery thrown away puts more toxic waste into landfill. In this bundle, the batteries come with a SunLabz charger, which has four slots for AA and AAA batteries. It has an LCD display which shows how full each battery is, and an integrated circuit control function to ensure efficient charging. Grab yours at the link below or read on for more details. Shipping is included in the sale price, and will take 1-2 weeks to arrive. Interested? Head to the link below to grab your SunLabz bundle.